The two Chinese zodiac signs of the tiger and the dog will find they can understand and accept each other’s personalities. This is very important to the tiger as they require independence to be happy. The tiger and dog in love are very close to an ideal couple. They will not have the same problems that other couples might. They both will be able to disregard each other’s negative traits. The tiger and dog relationship will be a nice, easygoing bond that is full of fun and contentment for both of them. Both these Chinese zodiac signs have a sense of nobility. They will both be protective of the ones they are close to. 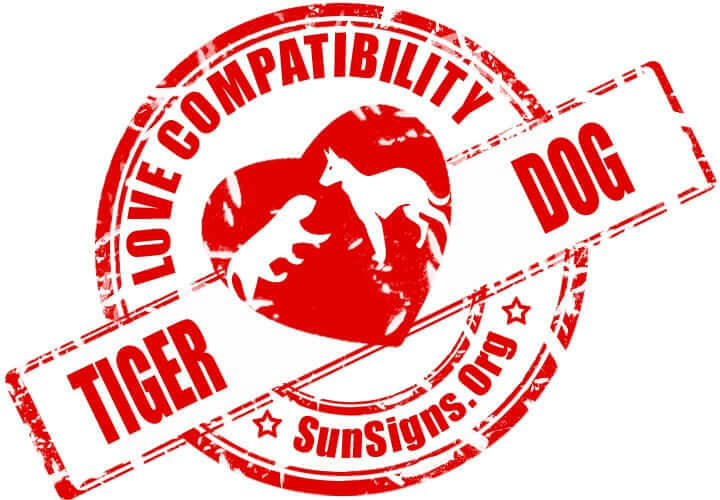 When the two Chinese astrology sign tiger is dating the dog, they can fit pretty well together sharing excellent love compatibility. They both have a sense of righteousness and are honest. Because of this, the tiger and the dog both will find it easy to understand each other and their choices. If the tiger and dog have an intimate and sexual connection, they will be able to make each other feel safe in bed. Both of them follow their own paths in this match. The tiger highly regards balance and does not like relationships that feel restricting. They will feel the dog is protecting them. They will be more than happy to give their partner the same treatment. They are noble, kind and brave. They need to be independent at all times. They will disregard the dog’s negativity and are good at cheering them up. The dog will protect the tiger’s requirements and interests, like individuality and freedom. They will be happy to be taken care of by the tiger and trust them immensely. They can be somewhat negative and has issues trusting other people. They can be somewhat moody and will want to have alone time. They are rational thinkers and never clingy. This will help keep the tiger on track and balance their excitable nature and enthusiasm, giving them a sense of security. Both the tiger and the dog soulmates are charismatic, appealing, and responsive. Because of this the tiger and the dog friendship will have a relationship that is rewarding. The tiger adores the dog’s loyalty. The dog accepts the tiger’s impulsive nature and lack of patience. A tiger wife and dog husband together might will make a good couple. The tiger woman and the dog man both value their freedom. The female tiger and the male dog both are naturally fair. They adore each other’s charitable nature, excitement, strength, and liveliness. A tiger husband and dog wife can form a very favorable couple. The tiger man is strong and will help the dog woman achieve their charitable goals. The male tiger and the female dog will be able to communicate with each other very well. In a tiger and dog marriage, they will always have something to talk about. The tiger will be willing to quit his or her job without thinking just to start something new. The dog will be concerned about money. Because of this, there might be some arguments but not enough to lead to a breakup of the tiger dog love match. Tiger & Dog Chinese Horoscope Compatibility Rated 5 Hearts!